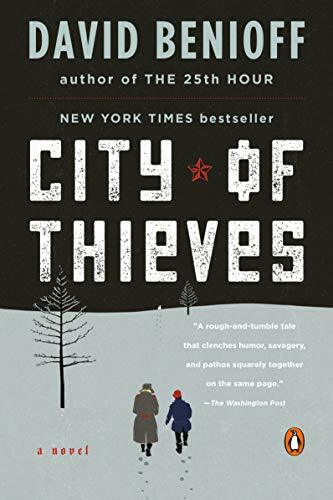 Book – City of Thieves is, in the author’s own words, a semi-biographical look at the Siege of Leningrad during the Second World War. A thief and a deserter are arrested and given an impossible choice, find a dozen eggs in a city cut off from all outside supply lines or be executed. While this is a rather weak quest, Lev and Kolya bring the city and the war to life for readers. While most ‘modern’ authors tend to write accents out phonetically so that you know they are speaking a different language, David Benioff restructured the sentences to give them a wonderful Russian cadence. Admittedly I don’t have much experience with the Russian language, but it flowed as if I was listening to Tevye from Fiddler on the Roof speak. For those who enjoyed Hotel on the Corner of Bitter and Sweet and The Guernsey Literary and Potato Peel Pie Society, City of Thieves is a humanizing account of World War II that reminds you of the entire story, not just what you were taught in school. Book – The Girl With All the Gifts is such a unique reading experience that I really don’t want to spoil it by telling you too many things about it before you start. So instead, I’ll introduce you to the main character, Melanie. Melanie is a very special little girl. She wakes up every morning in a cell, and soldiers strap her to a chair to take her to class. On the best days, class is taught by Miss Justineau, who was the one who told Melanie the story behind her name. Sometimes, one of the other children from her class will disappear, and no one will explain where they went or why. And then, one day, Melanie finds out. This is a tremendously moving book, full of rich characters and heartfelt relationships. Miss Justineau cares so much for Melanie, and Melanie for her, but even the less sympathetic characters grow on you over time as you learn, along with Melanie, more about who they are and what they care about and fear. If you liked Kauzo Ishiguro’s Never Let Me Go, Richard Matheson’s I Am Legend, or Mike Carey’s other work, you will love this book. Book – Teddi Overman owns an antique shop in Charleston, where she can fulfill her passion for restoring and selling antiques. She works with her two quirky employees, Albert and Inez. While her life is filled with her work, friends and caring for her Grammy Belle who lives nearby, she is haunted by her childhood and the family she left behind in rural Kentucky. She is estranged from her mother, who wanted her daughter to be a secretary and disapproves of her career and life choices. She also mourns the loss of her younger brother, Josh, who mysteriously disappeared years ago. As she tries to reconcile her present with her past, Teddi uncovers the secrets hidden beneath her family’s pain and comes to terms with their choices. Charming, hopeful and filled with eccentric characters, this book is an engaging summer read by the author of Saving CeeCee Honeycutt. Book – You may know Julia Keller as a reporter and editor who worked at the Chicago Tribune, where she won a Pulitzer Prize, but she also wrote three adult mysteries in the Bell Elkins series. The first book, A Killing in The Hills, begins as three elderly men are gunned down at a diner. The county prosecutor, Bell Elkins, may be the next victim, because her rebellious 17 year old daughter, Carla, is a witness to the shooting and is keeping some secrets of her own. Also, Bell together with her friend from childhood, Sheriff Nick Fogelsong, wage their own war on drugs trying to find the source of a growing distribution of illegal prescription drugs. Bell’s single mother life is further complicated by a case where a mentally challenged young man is accused of murdering his friend. This is a page turning haunting mystery set in a beautiful but poverty stricken small town in the Appalachian Mountains. The book has received starred reviews from BookList, Kirkus, Library Journal, and Publisher’s Weekly. Looking forward to reading the next books in the series Bitter River and Summer of the Dead. Book – Jordan Ellenberg, professor of mathematics at the University of Wisconsin-Madison, has written a book about math: not how you learned it in high school, but how it really is. We’re not talking about addition and subtraction here, or even algebra or calculus. (Well, a little calculus.) What Ellenberg is talking about in this book is the way math works, the way math shapes the world, and the way we can use math to change how we understand the world. Yes, I, too, know that one guy who thought both Gore and Bush were tools of the capitalist overlords and it didn’t make a difference who won. I am not talking about that guy. This is a massively enlightening and entertaining book, and if you like having your mind blown but always suffered through trig by looking things up in the back of the book and praying you’d remember the formulas long enough to get through the test, you may enjoy How Not to be Wrong more than you might think. Reading mysteries set in interesting locations is one of my favorite forms of armchair travel. In this whodunit Ken Tanaka, who became an amateur detective when he solved a murder involving a samurai sword in California, is invited by a Japanese television show to an all-expenses-paid trip to Tokyo to share the story of his adventure. Descriptions of the nuances of his travels were especially entertaining. Despite being a third-generation Japanese American, Ken experiences some culture shock as he interacts with the television studio team. He also learns something about himself and his identification as an American regardless of his ethnicity or minority status. His humble sense of humor is likable and the overall tone of the story is light. In addition to traveling among the sights in Tokyo, Ken’s sleuthing propels him into a treasure hunt in rural settings near Kyoto. Japanese history and legends color this mystery nicely. The historical embellishments as well as some code deciphering are slightly reminiscent of a Dan Brown novel. However, descriptions of humorous missteps that occur while traveling in a foreign land lighten the tone of this book. Book – Dabney Kimball Beech is the enthusiastic Director of Nantucket Island Chamber of Commerce. Married to a famous economist and professor, she has built a full life promoting the island and making a home for her husband and daughter, Agnes. She also has a gift for matchmaking, as over forty couples can attest. She sees a mysterious pink haze for a loving match and a bilious green haze when trouble will follow. When Agnes falls for the rich and controlling CJ, she ignores her mother’s warnings against the match. Then, Dabney’s first love, Clendenin Hughes, arrives back on Nantucket after being gone for more than twenty years. Dabney is forced to confront feelings she thought were behind her, even as events around her begin to spiral out of control. This novel explores love, friendship and second chances. I enjoyed spending time with these characters. It’s a great book to bring to the beach. Hilderbrand has written several novels, including Beautiful Day and Silver Girl. as the “swampers”) became The Muscle Shoals Sound Rhythm Section session musicians. Countless major hit songs and great albums were subsequently recorded in these studios – as amazing as it seems. Many great recording artists are interviewed in the documentary, such as: Mick Jagger, Keith Richards, Bono, Alicia Keys, Etta James, Aretha Franklin, Wilson Pickett, Gregg Allman, Lynyrd Skynard, Elton John, Boz Scaggs, Willie Nelson, Paul Simon, Bob Dylan and many more. It is the remarkable story of how initial successes in soul and R&B led to the arrival of more mainstream rock and pop performers, and how the Muscle Shoals vibe produced so many great hits. Literally every big name wanted to record in Muscle Shoals, and to “get down and get greasy.” Filmaker Greg Camalier premiered Muscle Shoals at the Sundance Film Festival in 2013, and the soundtrack alone will give you goosebumps. I loved this documentary and all the incredible vignettes, such as how Aretha Franklin just blossomed for the first time, when she got into the Muscle Shoals studios. Book – I came across this book through Tor.com’s Summer of Sleaze, a series of reviews of old horror novels, where the writers refer to Tryon’s work as “a third of our horror roots,” along with Rosemary’s Baby and The Exorcist. I’d never heard of Tryon before, so I was intrigued. And I was not disappointed. In fact, I’d say my expectations were set unfairly low – after all, the review series is called “Summer of Sleaze.” There’s nothing sleazy about The Other. A little purple, maybe, but not sleazy. Holland Perry is not a nice little boy. In fact, he’s downright sinister, pulling pranks that are more vicious than funny. (We find out on page three that he killed an old woman’s pet cat.) His twin, Niles, is a much friendlier young man, but he makes plenty of excuses for Holland’s increasingly outrageous behavior. This is a slow-building novel; we spend lots of time with the characters where nothing particularly awful happens, until quite suddenly it does. And although The Other was billed as horror when it came out, it’s much less supernatural than the other evil-child stories of its day. In fact, I’d call it a psychological thriller instead, with as much in common with Gone Girl or The Dinner as with more traditional horror novels.